Stephen W. Terrell's (MUSIC) Web Log: SWEET LORDY JESUS! I'm hearing voices from the tomb. Ready any time you like. 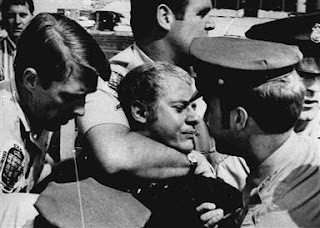 When it's time to strike ..."
From "Pinhead for Your Love"
And now they're freeing Artie Bremer, the guy who shot George Wallace down in 1972. And it looks like Sarah Jane Moore might be getting out too. (But not Squeaky. She apparently likes prison life.) Here's a story about it: CLICK HERE. Could this lead to an aging (would-be) assassins speaking tour? It's got to be worth at least one big Larry King show.